I could wax lyrical about my love for a good cleanser – it’s my favourite type of skincare to buy because although you inevitably rinse it off after a few seconds, I think they prep the skin for the rest of your routine. I love a good cream cleanser to treat my dry skin, and to make sure my face is really clean but not stripped at all. If the thought of a cream cleanser puts you off because it sounds too rich, then I would point you in the direction of this mud cleanser from cult-cleanser brand, Omorovicza. It has lots of clay in it as well as zinc oxide to balance the skin but as it’s housed in a creamy texture it doesn’t dry the skin at all. This is the perfect second cleanse in the evening – especially if you live in the city – as it leaves your face perfectly clean and purified. It feels like a real treat when massaged into dry skin and the combination of eucalyptus, peppermint and lavender makes the whole thing smell incredibly decadent. Definitely a cult cleanser, the OG cream cleanser has had a little revamp in the form of rose and lavender. With the same formula, this cleanser is perfect for when you want to quickly clean your face as the formula effectively cuts through grime and makeup (and takes off mascara without stinging the eyes). It’s not something I reach for every single day, but it’s one of those skincare items you can always go back to, safe in the knowledge it’ll be as effective as ever. This has my favourite ever skincare smell – it instantly makes me feel really relaxed and calmed; I’d wear it as perfume if I could! Every time I have a facial at Clarins they use this and it always feels lovely and soothing on the skin! It’s one I always go to when my skin is inflamed, sore because it’s lovely and light – I don’t need to use a flannel with it as it just rinses off. I’m not too sure how much it does rid the skin of pollutants, but with ingredients like moringa seed to detoxify and the fact that Clarins knows its stuff means it leaves skin soft and balanced. One of my favourite budget + eco-friendly brands, this cleanser is completely free from any nasties and it’s packed full of rosehip oil which my skin seems to love. It has an impressive ingredient list – aloe vera, avocado oil, rosehip, shea butter and babassu oil so it’s pretty rich in texture and an absolute treat for dry or dehydrated skin types. It’s similar to the Liz Earle in terms of being able to melt off all makeup. 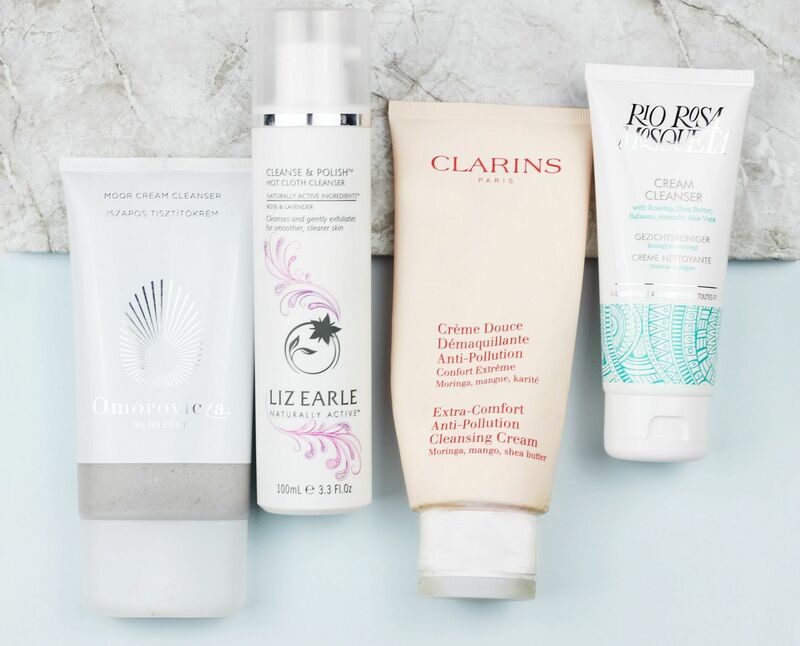 Do you love a good cream cleanser?